The Friends of CSIRO had a forum at the State Library of Victoria, moderated by Kate Auty. Senator Kim Carr spoke and announced that if elected, Labor would restore $250 million to the CSIRO budget, reversing the cuts currently underway. Adam Bandt science spokesperson from the Greens said they would would go further, investing slightly over $300 million, and boosting funds for R&D generally. Both were very welcome statements. Penny Whetton, Honorary Fellow at CSIRO spoke of her 25-year personal involvement with climate science in CSIRO, constructing every edition of the projections (began by Dr Barrie Pittock) and leading the last two editions (the latest here). Of course, with the cuts, no more of these would be possible at this scale. Kelly Mackenzie from the Australian Youth Climate Coalition spoke about the desire of young people to be able to have a career on science and also to have a world where public good science had contributed to reducing problems like climate change. Sam Popovski of the CSIRO Staff Association spoke about their ongoing efforts to preserve jobs in CSIRO, where a massive 20% have disappeared since 2013. 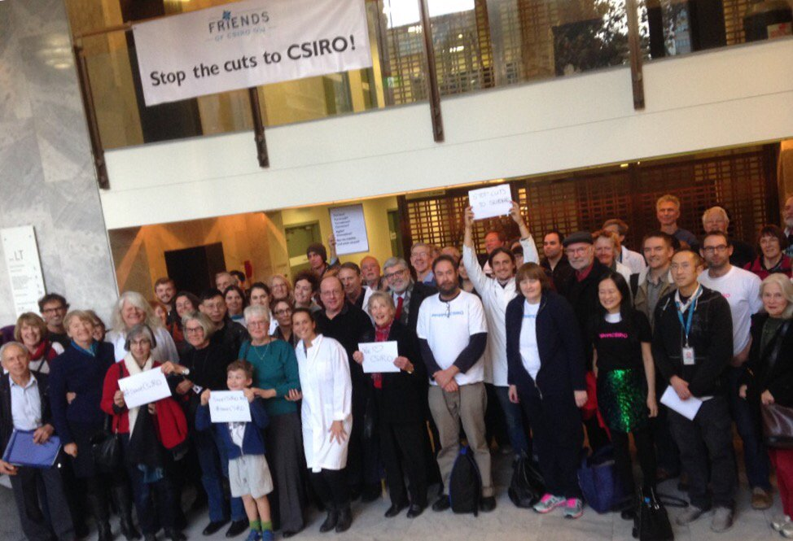 Their election campaign is here, and the Support CSIRO page where a lot of the information about the current proposed cuts of 300 more staff, mostly in public good research, can be found here. Also from the floor, we had good comments from Senator Janet Rice of the Greens, Professor Barbara Norman and the good Greg Hunt (SE Councils Greenhouse Gas Alliance). My mum turned up, having driven three hours from up country. The focus now would be on delivering the Prime Minister’s innovation and growth agenda, said Marshall. That meant funds once devoted to so-called ‘public good science’—such as monitoring and measuring climate change—would be directed elsewhere. This is just as true today as it was then. Public good exists separately to the views of the Government of the day, although they can and will offer their own policy interpretations of it. For CSIRO to roll over and operate under this type of regime, where science and research becomes subservient to policy to the point where the government as customer comes before the CSIRO charter and the people that charter serves, is governance degraded to the point where CSIRO may as well shut up shop and give the game away. For the CSIRO Board to countenance this sort of claptrap from the CEO is untenable. This makes it quite clear that there is a substantial public good component in 1a ii and 1a iii that is not subservient to 1a i or 1a iv. This is the sense of public good that is not just generated by scientific knowledge, but engages in its work consistent with the endowment that work provides to the public without any expectation of direct profit as a return on expense. It is clear that Marshall and many of his colleagues in government either do not know what public good research is, or does, or don’t care. It is not clear to them what its role is in underpinning the economy by 1) reducing the risks from processes such as climate change and environmental degradation and 2) by increasing human welfare and environmental benefits in social-ecological systems dominated by human activity, such as cities and farmland. This is an issue that desperately needs a larger public profile.